Dan Bennett is a regular at sales meetings and motivational seminars nationwide, where he showcases his talent and humor to elevate teamwork and problem solving. He also appears simply as a variety comedian for any number of events. While earning his bachelor’s degree in mathematics, Dan worked as a teaching assistant in the math lab. His love for teaching soon spilled over into tutoring with comedy. 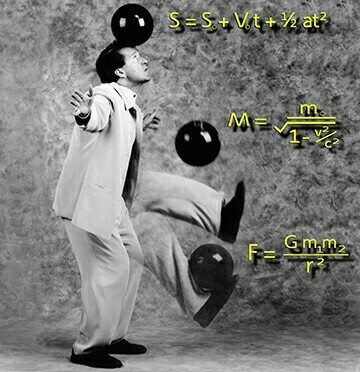 Eventually Dan was holding workshops in calculus and mixing mathematics with humor and juggling. While lecturing about ballistics he devised the object lesson now so central to his performances: catching a bowling ball with his face! A show was born! Dan began headlining on the major cruise lines and in comedy clubs. Appearing on the tonight show with Jay Leno, Arsenio Hall and other talk shows set Dan on a course that has never turned back. He has been featured in some 30 commercials for global corporations, and his trademark counting with Roman numerals has been used in conjunction with the Merck Corporation to promote product visibility. Dan has four gold medals from the international juggler’s association and is in the 1990 Guinness Book of World records for numbers juggling. These skills are indispensable in his performances as a science and math variety comedian and he has been the keynote “comediantic” at several mathematics conferences. backdrop .